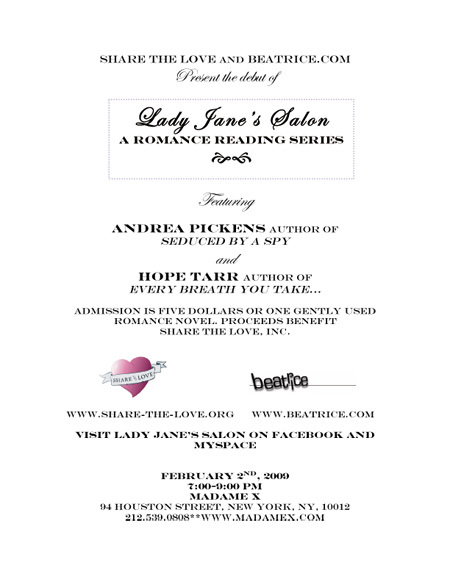 To be honest, I’m not the driving force behind Lady Jane’s Salon, a new reading series dedicated to romance writing that is debuting next month at NYC’s Madame X with guest stars Andrea Pickens and Hope Tarr. But when Hope, along with novelists Maya Rodale and Leanna Renee Hieber, asked if I would be interested in hosting a series that also serves as a monthly fundraising drive for her non-profit organization, Share the Love, I immediately accepted. The group distributes “gently used” romance novels to institutions that serve women—domestic violence shelters, halfway houses, prison libraries, and so on—promoting literacy and optimism. I’m excited to be involved with the organization, and I hope those of you in New York will consider coming to our events. Andrea and Hope will be reading on Monday, February 2, at 7 p.m. Admission is $5 or a paperback romance.